In Europe it is common to set problems and routes by color of hold. If we set like this, we wouldn’t have been able to set all those yellow holds on the right in the picture above because they would all be on the same problem. 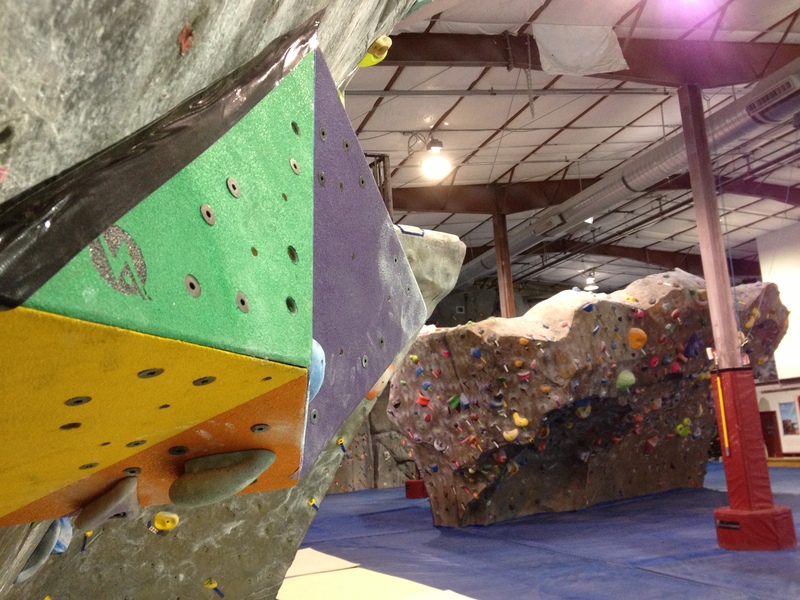 Like most gyms in America, at The Spot we use colored tape to differentiate the holds on routes and boulder problems. Each problem will have a start box (usually tape in a V or a U around the start hold with the route information on it), taped holds on the problem, and a finish box at the top of the wall or taped finishing hold. The idea behind tape is to be able to see different problems on a crowded wall. 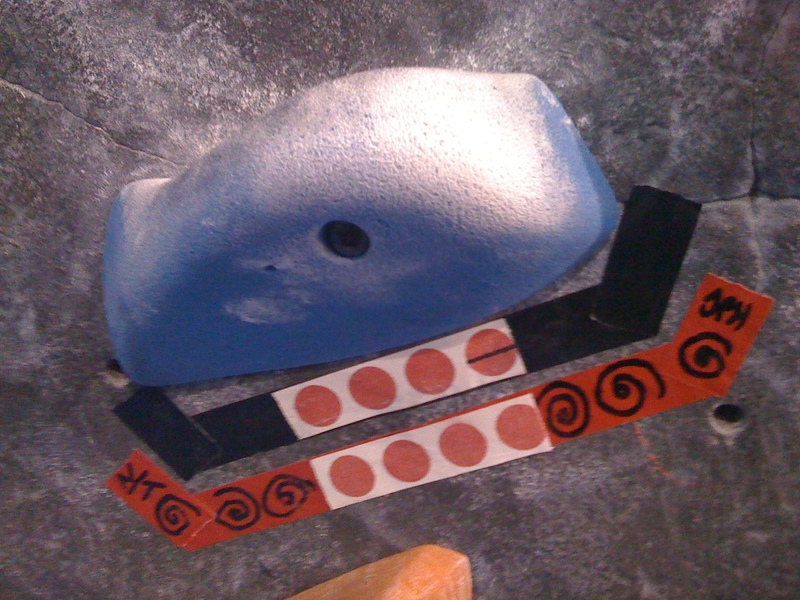 On a bouldering wall it is especially useful as you often have holds in every available t-nut, and if you set by color you would run out of colors quite quickly. The result would be a much sparser set. 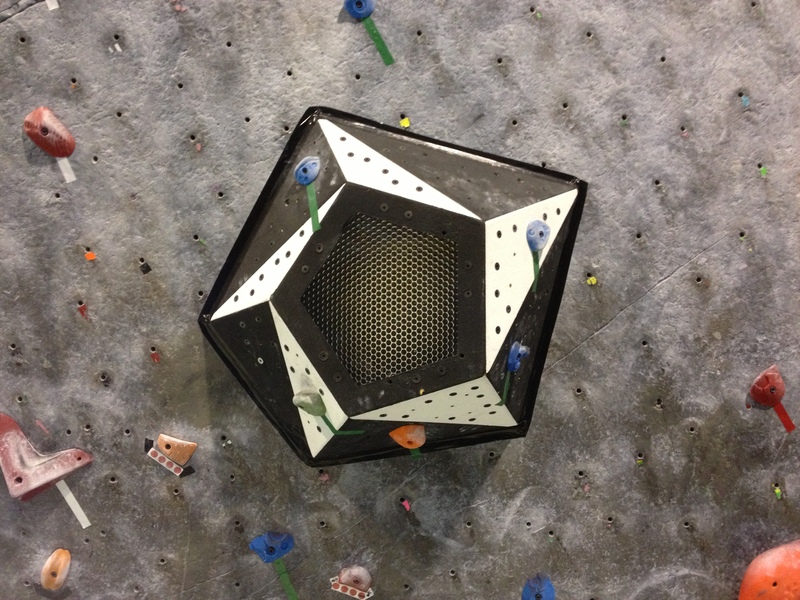 We prefer a more dense set as it allows climbers to make up their own problems and also it gives climbers many problems to choose from in each reset. The tape all goes approx. the same way. At The Spot we put all tape on in a 45 degree angle down and right (or, on a clock, approx. 4:20 – 4:25). 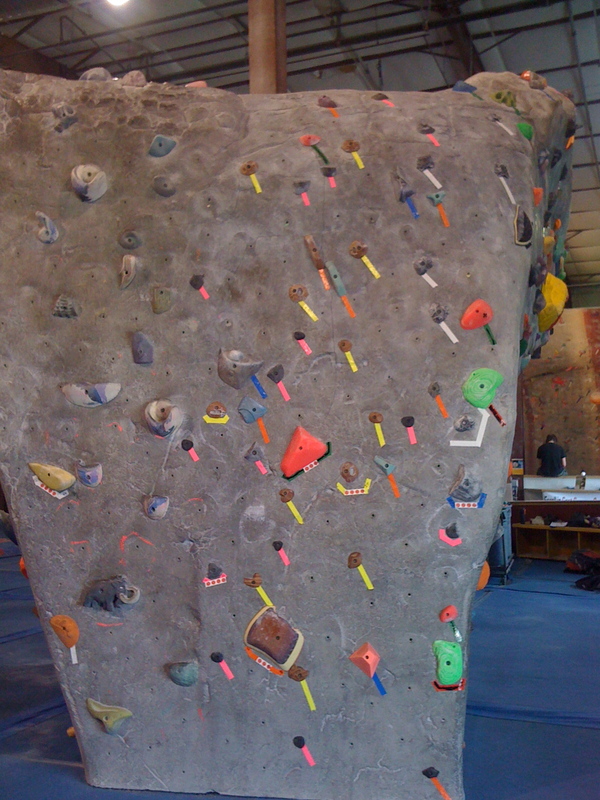 This makes the wall look nice and also helps the climbers know exactly where to look when looking for “on” holds on a problem. Sometimes due to other holds or wall features the tape will be on at a different angle, but most will be about the same. When we started taping like this we used to joke that a stiff breeze had come along and blown all the tape in the same direction. The downward tape angle helps protect the tape from rhinoceros-footed climbers who push and drag their feet down the wall and, in doing so, rip off tape. Another way to protect tape is to pin the top of each strip under the hold. This makes it very clear which hold the tape is on and also helps to reduce tape loss over the life of the set. Despite these steps, tape is often worn off and it is necessary to do tape maintenance, i.e., someone walks around with a bunch of tape and a wrench and fixes rolled or missing pieces. It is useful to have many different colors of tape in your setting arsenal so you don’t overly confuse your customers if you wall is set with many problems. Once you run out of colors, or if two problems of the same color turn out to be too close to each other, you can “double tape” one problem, i.e. add a mark, line, or design with a permanent marker or add a stripe, dot (we call it a chico dot), strip, or other 2nd piece of tape to the marking tape to set it apart. Double (or triple, etc) Tape can also refer to putting multiple pieces of tape on the same hold and using it on multiple problems. We double tape at The Spot, especially big features, because we strip and set an entire section of wall each week so even if a hold is multi-taped it will only be up for a maximum of 6 weeks. The other note about multiple pieces of tape on a hold: we try to make sure each piece of tape on a multi-taped hold is the exact same length and placed at the exact same angle as the other tape on the hold. It just looks nicer. Our daily setting tape is 1″ duct tape. 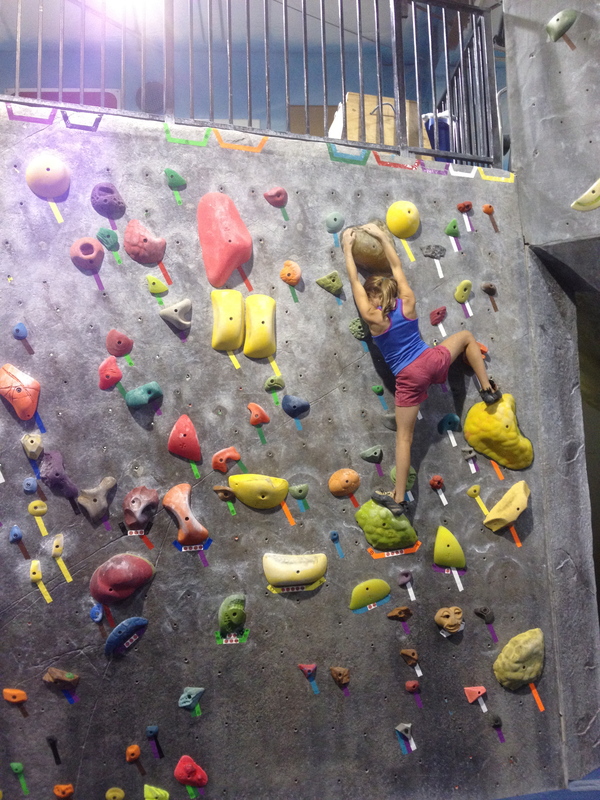 We find 1″ to be easier to use than 2″ because it takes up less space on the wall and, as we set only boulders, we often set a fairly dense wall. Too much fat tape will take up too much space that should be full of holds. Some gyms do use a 2″ width tape though. Psychedelia glows with gaffer tape. Notice the fly on the right. Gaffer tape is a cloth-based tape that was originally used by gaffers (movie set electricians). It is way nicer than duct tape, it has a better construction so it won’t fall apart, it rips easily, etc… but it is also much more expensive. 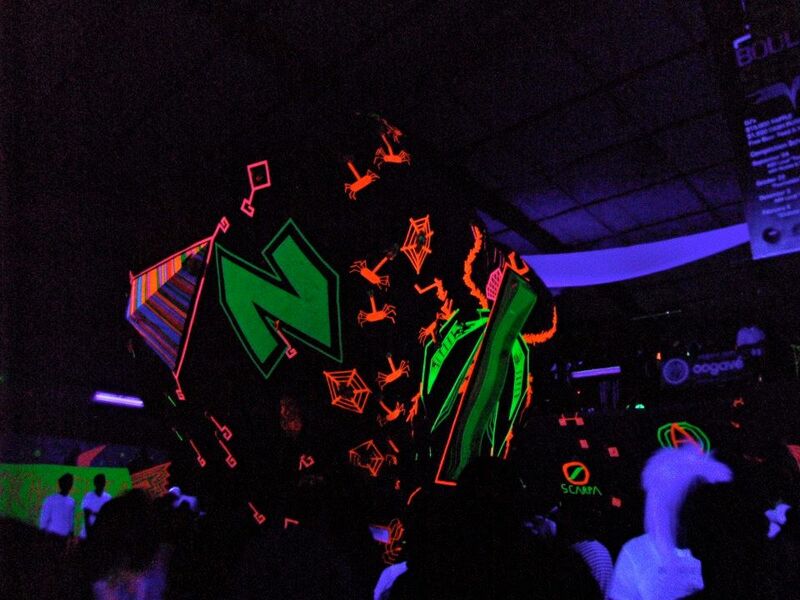 We don’t use it at The Spot except during Psychedelia when we use neon gaffer tape. The cloth backing makes it glow better and it is easier to work with for wall art. Our grades are marked with custom made spot tape. Many companies offer special or custom prints on their gaffer tape. At The Spot we have spot printed tape for grading problems. During Psychedelia we often get moon and stars neon gaffer tape, and sometimes other special prints as well. Many companies have produced logo-printed tape at one time or another. Close up of volume edge tape. For taping volume edges we use 2″ black duct tape. 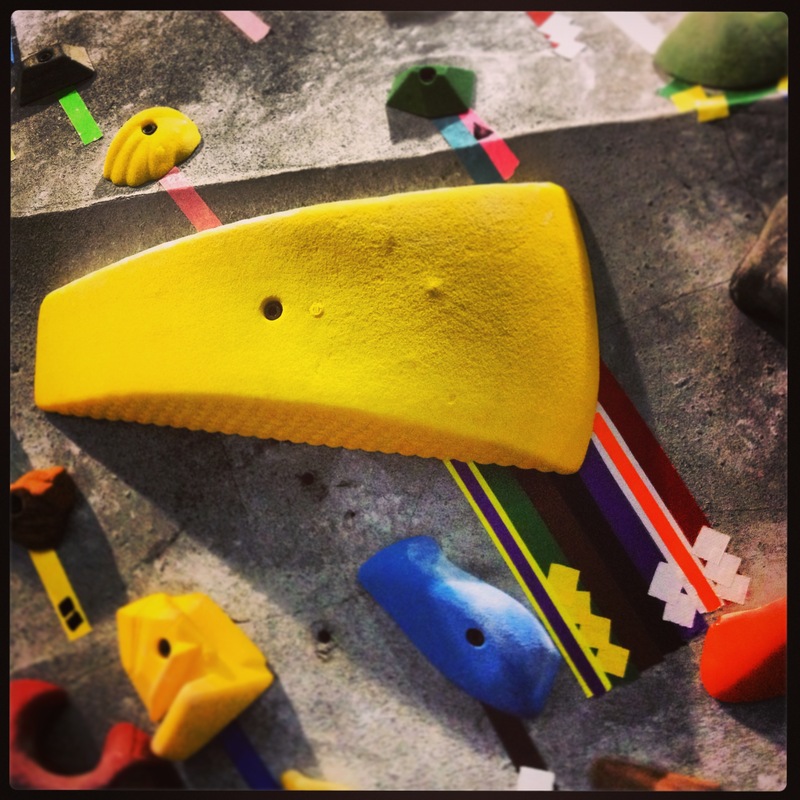 To tape a hanging edge of a hold we either use 2″ black or we use a regular roll of 1″ that is layered. I find it best to tape the wall, then tape the tape from the hold to the tape you’ve taped on the wall. 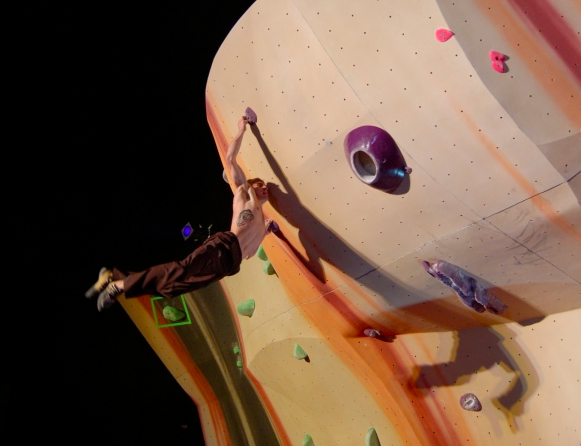 It usually doesn’t look that great, so it’s better to get the holds flush if you can. For volumes the edge tape looks fine if you trim the corners with a straight-edge. The Speaker Box Volume. Edges taped and cut. Even within a brand and between different batches there can be some variation in tape adhesive quality–some tape sticks to the wall and some doesn’t, some rolls don’t stick at all, some rolls stick so well that they fall apart when you’re trying to take the tape off later. Changes in temperature while the tape is on the wall can also affect this–very hot days can make the tape practically bond to the wall. Human skin oil, silicone, excessive texture, and other things that may be on or get on the wall can also affect how tape sticks. If you have unsticky tape, you can pin the tape under the edge of the hold to try and keep at least part of it on the wall. In cases of wood or fiberglass walls, a staple gun can also help you with this problem (though after a while you’ll have a lot of tiny holes in your wall, and it may be hard to get the staples out unless you’re stapling gaffer tape since gaffer will stay together better and give you some leverage to pull the staple out. Regular duct might just fall apart. You can use pliers too if you want to have even more fun). If you have plywood or coated plywood and your tape has bonded you can scrape it off with a paint scraper. For our concrete walls we just use other pieces of tape to get the stubborn tape off. For the most part with Pro-Duct we don’t have these problems and the tape comes off in one piece.